1. The jumper wire above C11 is not shown . 2. The locations of the resistors R27 and R19 is reversed. The values of the resistors R15 and R17 are reversed. R15 should be a 33K resistor and R17 should be a 16K resistor. In my schematic R15 is the resistor connected to pin 7 of U3 and R17 is connected to pin 8 of U3. This error causes the two modem frequencies to be reversed. The 1uF capacitor C4 is not listed in the parts list. 1. Remove D2, D3, and D7. 2. 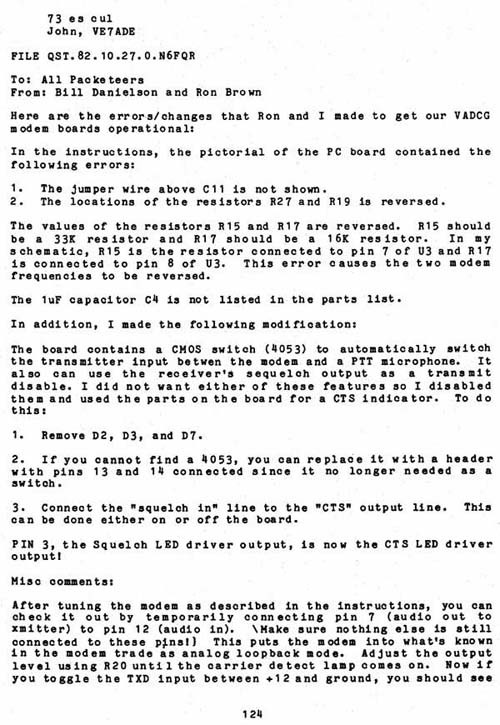 If you cannot find a 4053, you can replace it with a header with pins 13 and 14 connected since it no longer needed as a switch . 3. Connect the "squelch in" line to the "CTS" output line. This can	be done either on or off the board. PIN 3, the Squelch LED driver output, is now the CTS LED driver output!